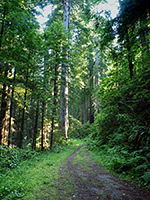 The main section of Del Norte Coast Redwoods State Park contains a forested ridge bordering the Pacific Ocean, harboring scattered groups of large, old growth redwoods, mostly just east of the crest. US 101 runs north-south near the high point of the ridge, right through some of the groves though as the ground is undulating and the highway narrow, parking places are limited and there are few trails. The west side of the ridge slopes down very sharply to the ocean, and the coast is largely unseen since the one path through this area (the lightly used Coastal Trail) is generally quite far from the Pacific, owing to the steep and inhospitable terrain. The coast is easily reached only at the north and south edges of the state park, at Enderts Beach and False Klamath Cove; the 7 miles between has just one other access point, via the steep Damnation Creek Trail. 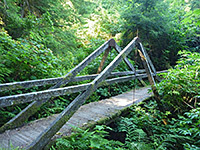 Hence Del Norte is the least visited of the four components of Redwood National and State Parks, though it does have a large, popular campground, on the east side of the highway, surrounded by alders, maples and small redwoods around the upper reaches of Mill Creek. An extensive region to the north and east was added to the state park in 2002, increasing its area to 31,400 acres (making it the fifth largest in the US), however all this land was exhaustively logged from the 1970s to the 1990s, and is now covered by newly planted trees. The Mill Creek watershed is crossed by many former logging tracks suitable for hiking, though this section of the park has little of interest to the casual visitor. The nearest town with hotels is Crescent City, a few miles north. US 101 is a busy, two-lane highway crossing the state park for ten miles with just one side road, to the Mill Creek Campground. This has 145 sites set in a quiet, pleasant area of the forest, from where several short paths lead through the predominantly new growth woodland; longest is the 3.75 mile (loop) Hobbs Wall Trail. 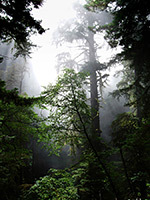 The higher sections of US 101 are lined by many tall and impressive redwoods, often enveloped in fog but illuminated by occasional shafts of sunlight, creating enchanting shadowy effects. Parking is possible on a few verges and at the two trailheads, but these are not well signposted so are easy to miss. One is near milepost 16 - the start of the 2 mile Damnation Creek Trail that encounters plenty of tall redwoods close to the road then links with the Coastal Trail and turns west, descending 1,000 feet over the next mile to a stony beach beside a narrow stream. 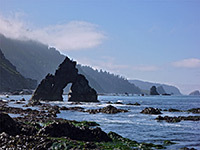 The second is half a mile south, where the Coastal Trail itself crosses the highway; from here Enderts Beach is 6.5 miles north (the Last Chance section), while Wilson Creek near False Klamath Cove (the DeMartin section) is 6.3 miles south; this part of the path is actually east of US 101, which runs close to the ocean for a few miles, right along the edge of precipitous cliffs. Although actually within a detached section of Redwood National Park, Enderts Beach is the northern start point of the Coastal Trail, the only extended hiking route through the state park. A side road forks south off US 101 two miles from Crescent City, passes several seaside-access points then ends at a nice viewpoint quite high above the ocean, looking down on the beach, beyond which the coast becomes cliff bound and inaccessible. Many years ago, before construction of US 101, this road provided the only route south, and a grassy track continues along the cliffs, now designated the Coastal Trail. It passes a few wind-swept cypress trees, descends into the overgrown valley of Nickel Creek then begins a steady ascent into the coastal mountains, moving away from the ocean. Beside the creek, a short, unofficial path leads upstream a way and another spur heads west, along the valley and out onto Enderts Beach. The NPS manage a primitive campsite beside the lower end of the creek but this is not very appealing - out-of-sight of the Pacific, lacking any views and overlooked by the trail. Enderts Beach has nearly a mile of dark grey sands with rocks and pools at intervals, target for ranger-led tidepool walks in the summer season. 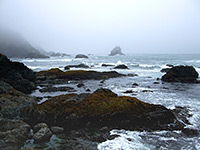 More extensive tidepools can be found to the south, past some protruding cliffs. 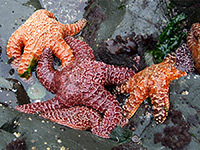 The waters are home to abundant marine life including ochre sea stars, giant green anemones, crabs, California mussels, whelks and much seaweed, all buffeted by the strong, constant surf and usually shrouded in fog. Del Norte Coast Redwoods State Park ends in the south at False Klamath Cove, where US 101 descends to the ocean for the last time until Freshwater Lagoon, 30 miles further south. 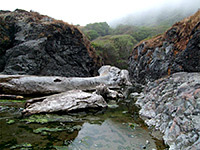 The cove contains a wide sandy beach bordered by two streams flowing into the Pacific - Wilson Creek at the north end, and a smaller, unnamed drainage at the other. There are several parking areas along the beach, one next to a small lagoon a short distance south, and another at 'Trees of Mystery' (a commercialized redwood grove) just beyond. The Coastal Trail meets US 101 beside Wilson Creek and leads northwards up a ridge, staying quite high above the highway while traversing mixed woodland for most of its length, before entering old growth redwoods shortly before the next US 101 crossing. 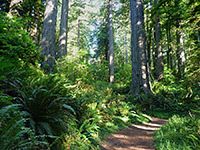 The 2002 acquisition of the 25,000 acres of woodland around Mill Creek and nearby Rock Creek extended the state park boundaries up to Jedediah Smith Redwoods in the north and Smith River National Forest in the east. Land to the south is privately owned, and still used for logging. A few paved roads enter the Mill Creek area, linking with many dirt tracks that climb to hilltops and follow valleys. Limited public access is allowed, pending final decisions on future management policies and recreational opportunities.